David Hurley paints a mural on the Family Dollar store in Belfast, depicting it as a ship, the SS Belfast. The corner of the Family Dollar Store in Belfast has been painted to resemble a ship. Artists David Hurley (left) and Russell Kahn pretend to swim the waves that come off the hull of the SS Belfast. The men painted the side of the Family Dollar Store to resemble a ship. BELFAST, Maine — The concrete wall roughly 100 feet long and 20 feet high that makes up one side of the Family Dollar Store off Main Street couldn’t escape the city’s creative spirit. Not content to see that wall remain a bland, consistent color, local artist David Hurley decided to put his — and the city’s — stamp on it. 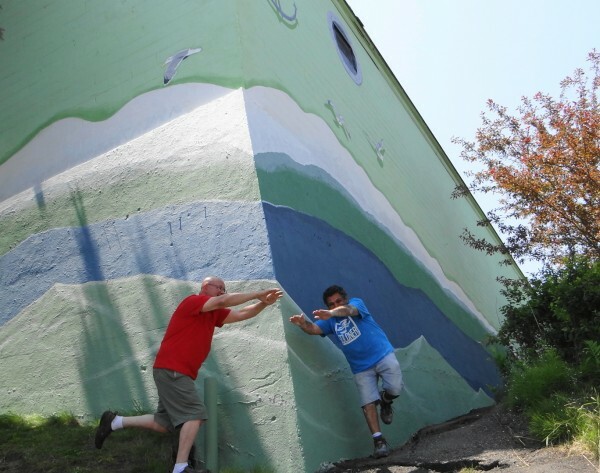 Hurley, with the help of artists Russell Kahn and Kenny Cole, painted the wall so it resembles the hull of a ship, plowing through ocean waves. 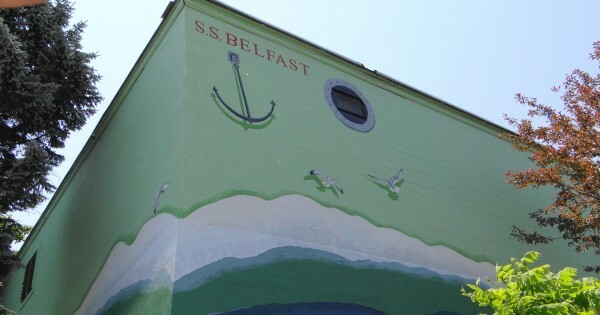 The SS Belfast also features a faux porthole — cleverly painted around a rectangular window — and seagulls. The project is less ambitious than a mural painted on the wall in the early 1990s. Back then, the cooperative artist group Artfellows solicited design proposals for the wall. Then residents were encouraged to view the design proposals at the Artfellows Gallery on Main Street and vote. Belfast’s Rick Cronin’s plan won. Cronin’s design conceived of the wall as a shelf in the grocery store that then occupied the space. Fifteen-foot high jars each contained an iconic image from the city — tugboats, landmark buildings and so on. After about ten years, the mural’s paint began to flake off, and repairs to the wall meant it had to be painted over. Hurley, who was one of the founders of the Artfellows group, was in Alaska working for a couple of months on a fishing boat at the time the first mural was painted and so missed the fun. When his brother Mike was the city’s mayor several years ago, he solicited proposals to restore the mural or create a new one. “Nobody stepped forward,” David Hurley recalled. About a year ago, he decided to come up with his own concept for the wall. He pitched it to the building owner, Jim Kaplan, who gave the plan his OK, and Hurley set out to raise the $3,500 to complete the work, including his stipend. 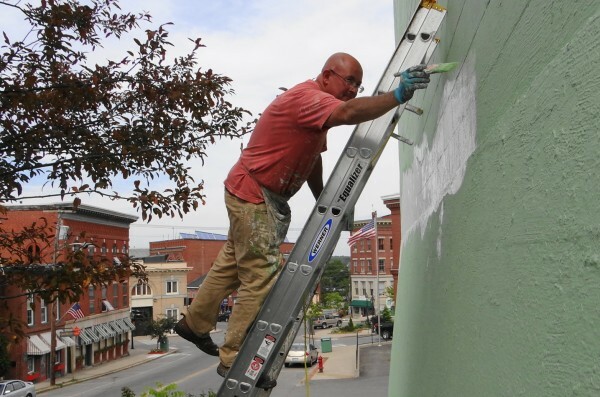 Local businesses such as Key Bank, Camden National Bank, Damariscotta Bank & Trust and Bangor Savings Bank all donated, Hurley said, and the local Sherwin Williams donated all the paint. Viking Lumber also pitched in. And a newer arts group in town, Waterfall Arts, also supported the project. Hurley soon realized a ladder wouldn’t do to reach the upper corner of the wall, where the grade drops steeply and there is no place on the earthen embankment to plant a ladder. “Larry Jones of Whitecap Builders generously lent me and [brother] Mike the lift,” an expensive and potentially dangerous piece of equipment. There were no mishaps. “What kind of intrigued me about the design was the economy,” Hurley said. Painting something as complicated as the previous mural seemed too big an undertaking. Seeing the walls while walking or driving up Main Street, he could imagine it as a ship. “I think one of the original designs,” in the contest in the early 1990s, “was to turn the building into a ship,” he remembered. Coincidentally, Cronin, who came up with the pickle jar idea, was a pilot of oil tankers at the time. And appropriately enough, the SS Belfast “ship” sits behind the Belfast Customs House and Post Office, where officials in the 19th century would spot incoming vessels and travel down the street to collect the necessary duties and fees. Hurley estimates he has put about 150 hours into painting. He still wants to tweak some of the colors. “It’s one thing to have a bad painting,” he says, laughing, and imagining such a failure gathering dust somewhere. But a 100-foot long public building? “You want it to exceed your expectations,” he said, and believes the final product does that. An August christening is planned.